When Chick-fil-A discontinued its Spicy Chicken Biscuit back in 2016, the move spelled not just the end of the beloved breakfast sandwich, but also one fewer spicy chicken option on the fast food chain's simple menu. Now, it looks like the southern fried chicken purveyor is finally serving up a bit more heat, with the introduction of two all-new spicy chicken menu items in just a handful of cities. 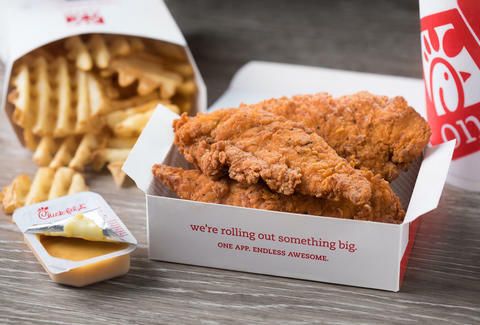 On Monday, Chick-fil-A said it's now offering the two new entrees -- Spicy Chick-n-Strips and a Grilled Spicy Chicken Deluxe Sandwich -- as part of a limited trial run at some of its locations. Specifically, you can get your hands on the spicy strips at outposts in Philadelphia, Central Texas, and South Texas while the sandwich is available at locations in Orlando, St. Louis, and Knoxville, Tennessee, according to a press release. The company said it wants customers to weigh in on the new options to see if they're popular enough to land on the permanent menu nationwide. So, uh, don't screw this up, Philly. A Chick-fil-A spokesperson said the launch of the Spicy Chick-n-Strips marks the first time the chain has offered a spicy chicken strips in its long, greasy history. They're made with a blend of spicy peppers and seasonings, hand-breaded, and cooked in peanut oil until they're crispy and ready for dipping. Think the existing Spicy Chick-fil-A Chicken Sandwich, but served in 3- or 4-count orders of strips. 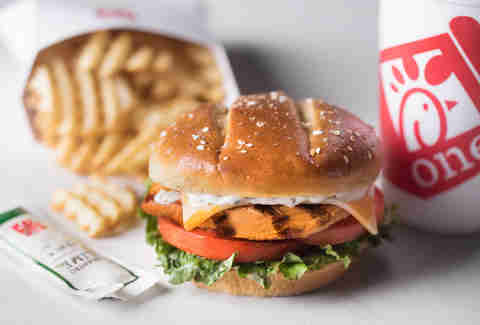 As for the the Grilled Spicy Chicken Deluxe Sandwich (shown above), Chick-fil-A describes it as the ideal order for people looking for a spicy option that's on the lighter side. The new sandwich features grilled chicken that's marinated in a spicy seasoning, colby-jack cheese, lettuce, and tomato on a toasted multigrain brioche bun. You can also add Cilantro Lime Sauce, which comes in a packet on the side. Of course, it remains to be seen if the new spicy chicken meals catch on enough to land at your local Chick-fil-A, but c'mon, it'd be crazy if they didn't. Make it happen, people. Tony Merevick is Senior News Editor at Thrillist and loves a good spicy chicken strip. Send news tips to news@thrillist.com and follow him on Twitter @tonymerevick.